This afternoon I taught my newlywed daughter how to make Conference Cinnamon Rolls that she has eaten twice a year since she was a toddler. I only make them twice a year when we gather together to listen to our church leaders speak at the LDS General Conference. Hence the name Conference Cinnamon Rolls. Her favorite job as a little girl was to lick the beaters and she still does. I'm posting out of request from my children and friends who have had these and love them. Enjoy! In a mixer add 3 cups of warm water, 2 Tbsp. SAF instant yeast, 4 Tbsp. sugar, 4 Tbsp. oil and 1 Tbsp of salt. Mix together on low speed for a minute. Add 4 cups of flour and mix until it is a wet dough. Add 3 half dollar size drops of soy lecithin. Mix again. Add 3 more cups of flour and mix together. You will want the dough to just pull away from the bowl. It should be soft and a little doughy but touchable. If you need to add a little more flour to get this consistency. Knead on medium speed for 3 minuets and let stand for 15 minutes. This helps the dough to relax. 3. Mix 3 Tbsp. of Saigon Cinnamon with 4 Tbsp. of sugar. Set Aside. 4. Melt one stick of butter. Set Aside. 5. Rub your counter down with some oil to work with the dough. 6. Softly roll the dough out into a rectangle about a 1/3" thick. Let rest a few minutes. 7. Brush the rectangle of dough with melted butter. 8. Sprinkle with a cup and a half of brown sugar. Make sure to get the sugar to the edges. 9. Sprinkle the Cinnamon/Sugar mixture over the brown sugar. 10. 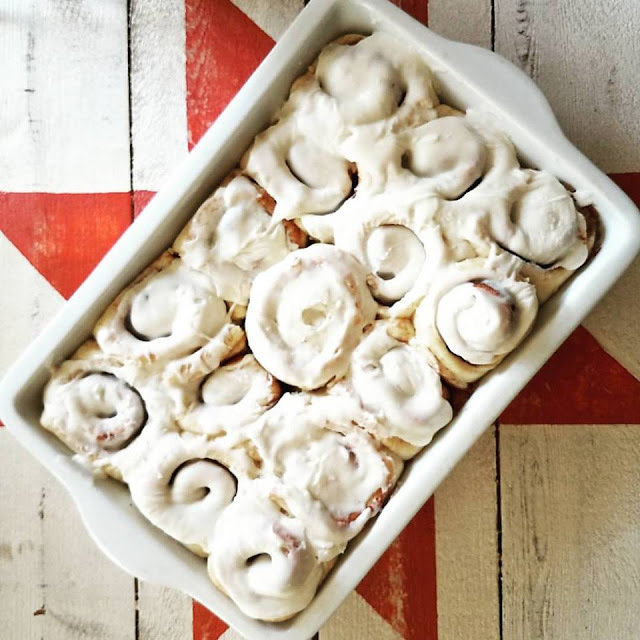 Take the long side of the dough and carefully roll towards you to make a cinnamon roll dough "log". Pat the ends into shape. 11. Break off a piece of unwaxed and unflavored dental floss about two feet long. Slide the floss under the dough to about a inch and a quarter length. Lift up the ends of the floss, cross over and cut the roll pieces. 12. Place the rolls in a deep greased 9" x 13" pan. (You will need two pans). Place so they are barely touching each other. Once they are all cut, lightly pat down the tops to make the circle shape. 13. Place the pan of rolls in the 200 degree oven for about 15 minuets to raise. 14. Once raised, turn the heat up on the oven to 350 degrees and cook until lightly browned on the top. About 20 minuets. 15. Once they are done, brush the tops with the remaining melted butter. In a mixer with a whisk attachment add 1 stick of softened butter and 1 block of softened cream cheese. Whisk together. Add 2 Tbsp. of vanilla. and 3 Cups of powdered sugar. Whisk together. Slowly add a Tbsp. of milk and whip until you get a soft frosting consistency. You may need to add a little more milk or powdered sugar to achieve the balance...but you'll get it. 17. Spread the frosting over the rolls and enjoy!!! We hope you love this recipe as much as our family has. They are sooooo good! One of the best aromas ever is a slow cooker full of apples and spice...there is nothing like it, and one of the easiest ways to enjoy the fall smells is by making Caramel Apple Butter. My family loves to eat it on crisp toast and pancakes. My favorite is over salted caramel ice cream...don't judge! All you need to make this simple apple butter is a slow cooker and about 20 large apples. My favorite kind to use are Jonathon's or Honeycrisp. They are the perfect mixture of firm, sweet, and tart. Wash your apples and peel them. I like to use my old fashioned apple peeler...it does the job in a matter of seconds. I think I found this peeler at Wal-Mart for $19.00. When the peeler comes my husband and kids are ready to help. Once the apples are peeled, you can use an apple slicer to slice them into large wedges. Place them in a slow cooker and turn it on to the low setting. It's ok if there are little bits of peel on the apple, they cook down great. Once the slow cooker is full, add four cups of sugar and three tablespoons of apple pie seasoning. If you can not find apple pie seasoning, mix together cinnamon, nutmeg, allspice, and cloves to a mixture you like. Put a lid on the slow cooker and cook for eight hours on the low setting. Stir occasionally to mix the spices and sugars through the mixture. You will have a delicious amount to apple juice that cooks out of the apples over cooking time. When the time is skim off most of the juice and set aside. The spiced apple juice can be cooked down to make a delicious apple syrup for pancakes! Once your apple butter is done, you can refrigerate it for up to three weeks or freeze it for up two months. If you want it to last through the winter, you can process them in a water bath for 20 minutes and they will keep for a year. You can find the instructions for the water bath process at the Ball Fresh Preserving Site. Just imagine a spice filled thick sweet and tart apple sauce in one bite...and you will know why we are crazy for this recipe! I usually cook up several batches through the fall to give as housewarming and holiday gifts. A jar of apple butter, and a loaf of bread and you have the perfect gift. You can view the KUTV Fresh Living Segment by clicking on the highlighted link. I hope you enjoy this recipe as much as we do!